So here we go with part two of a series of blogs which attempt to catch up with what’s been going on over these past few crazy weeks, but I begin with the good news that the technical problem with my blog has been resolved, and so I should now be back to the usual programme of annoyingly frequent updates on all my everyday shenanigans. 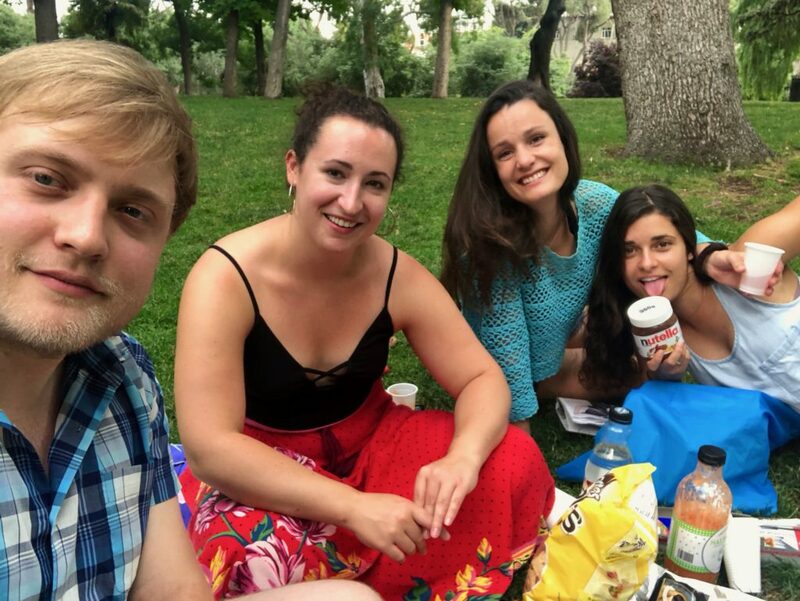 I’m afraid that I have to start the blog on a rather sad note, as the arrival of summer has also hailed the end of a few of my friends’ stays in Madrid. We all knew the day of their departure was coming as they were working on finite contracts here in the city, but it hit us quite hard nonetheless. As optimistic as ever though, we resolved to spend their last weeks and days doing as much fun stuff together as possible. Our friend Kitty, who I rather unfortunately only met for the first time very recently, was the first to leave one Thursday morning, and we could think of no better send off than a special farewell edition of our traditional Taco Wednesdays. As per usual we spent the evening munching our way through multiple orders of tacos, getting gradually tipsier on frozen margaritas, and laughing our way through all the week’s anecdotes. 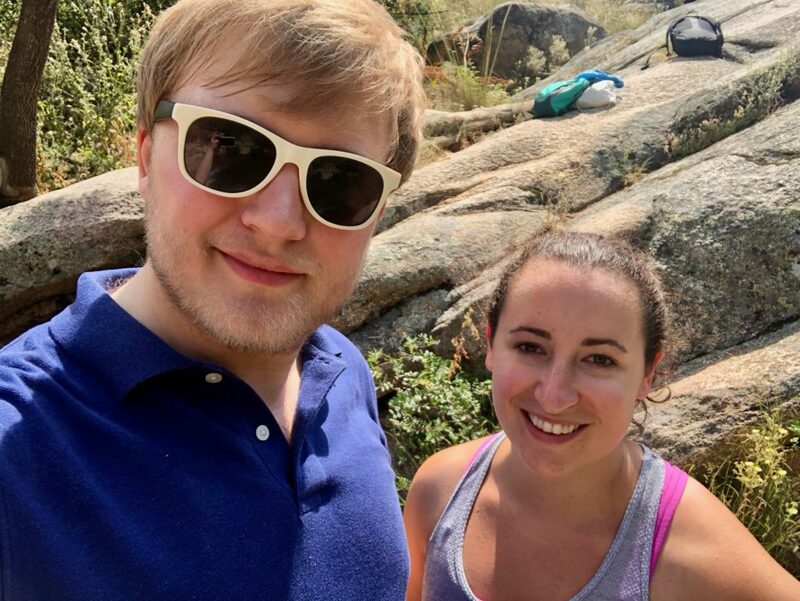 The only thing different that week was an emotional farewell as I headed home, wishing Kitty the best of luck as she heads back to the USA to study medicine – quite the change from the relaxed pace of life here in Spain! The next day me and Megan arranged to meet up for dinner at a spot I’d been told about but had never tried, Nap Pizza. This place sits in the heart of one of my favourite of the city’s districts, Lavapiés (check out an ode to it a few blog posts back), and served us up probably the best pizza I’ve had since I moved out to Spain. 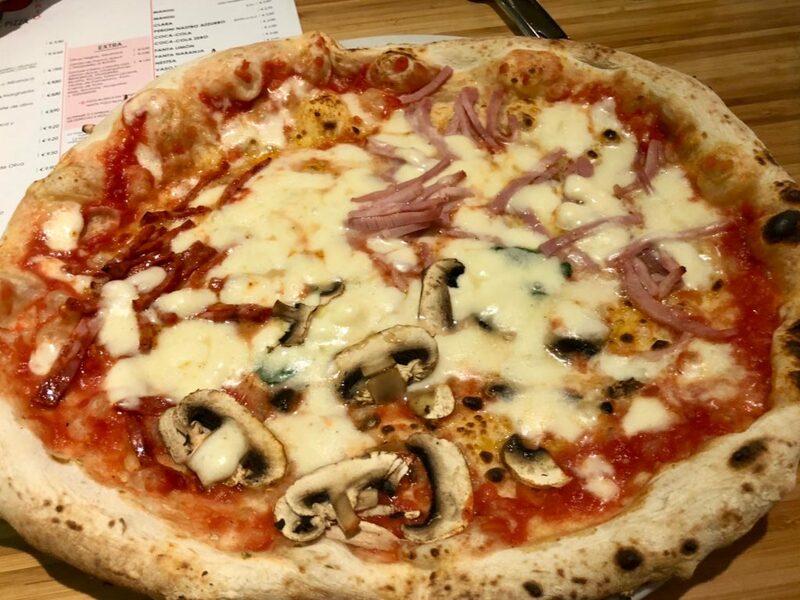 I would up feeling a little bit sentimental, as it reminded me of the many days spent at Belgrave in Leeds, eating delicious half-price pizza and drowning our sorrows in student-price pints. Side note: Holy hell, I can’t believe the linked blog post about one of Belgrave’s many Street Feasts is well over four years old. Am I getting old? That Friday, and to start Loredana and Megan’s final weekend off with a bang, we’d planned to go for a big night out in a club in Chueca. With all of us being old and tired, however, those plans were soon scrapped in favour of a more tranquil evening, as we decided to have a picnic in the park to make the most of the weather. Such a laid back evening would also allow us to pursue our plans for Saturday, as we’d agreed that we wanted to go for another mini hike up into the Madrid mountains. As I returned home on the Friday I immediately set about making things for the picnic, with a special inclusion that I had been thinking about making for quite some time. 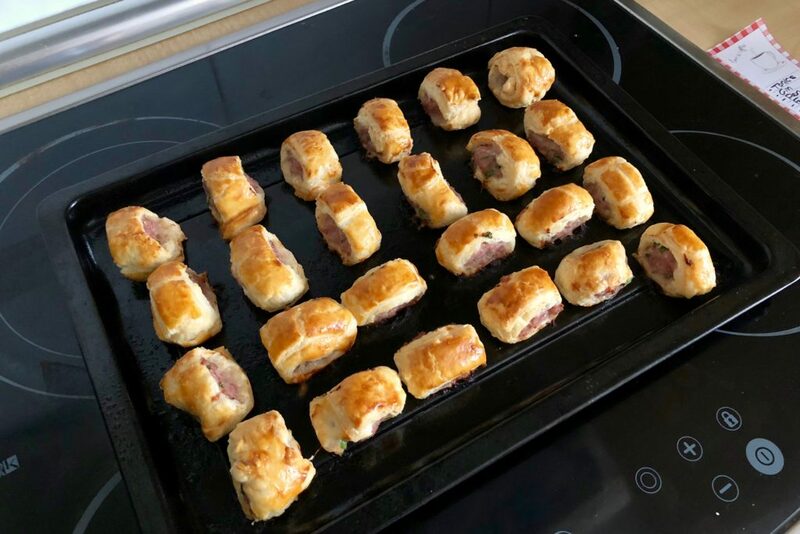 The picnic setting provided the perfect opportunity for me to try my hand at making one of my favourite British savoury snacks which I have been missing like crazy, and which just so happen to be a picnic staple: sausage rolls! I don’t want to call myself Greggs or anything, but I was quite pleased with the results, even after it seemed that the whole thing would end as a soggy puff pastry disaster when the Madrid heat had the dough sticking to everything literally minutes after I’d taken it out of the fridge. 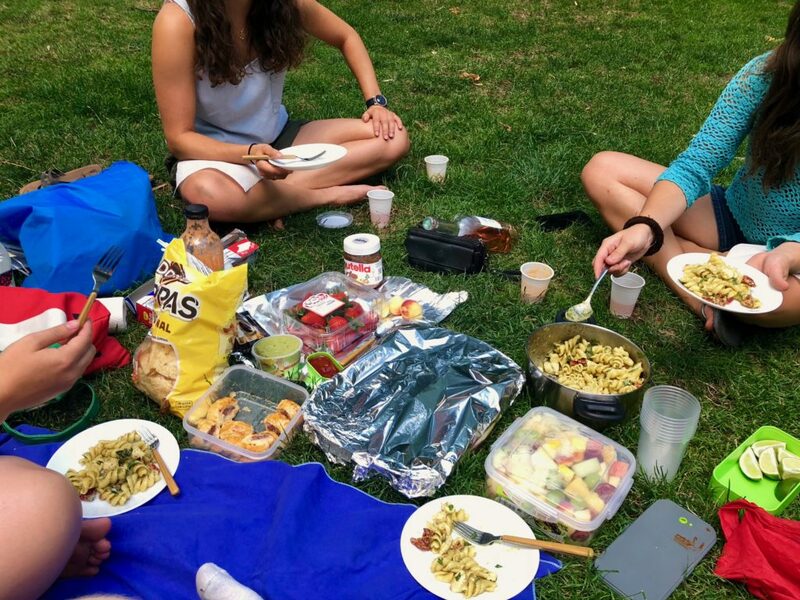 Once I had them rustled up, and I’d thrown together a pesto pasta salad and a huge box of fruit salad, I traipsed the lot in my trusty backpack and fold-up grocery bag up to the park. Once I eventually managed to find the three of them – I was late as usual – we pooled together all our food and the outdoor feast began. It would seem that Loredana is a big fan of Nutella on the right there. Once we’d worked our way through as much as the grub as possible, and collectively eaten 3/4 of a jar of Nutella pretty much straight off a spoon, the sun began to set and it was time to call it a night. We arrived home relatively early to get rested for an early start the next day, as we were scheduled to convene at the northern bus station in order to catch a bus up to the mountains. 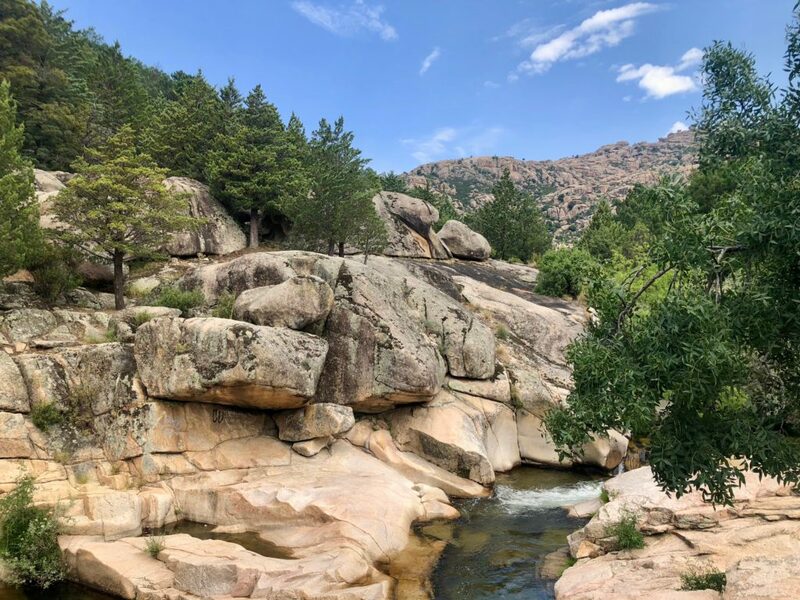 We had decided to once again pay a visit to Manzanares el Real, after last time we had such a lovely time relaxing up by its cool river and clambering over its rocky terrain. 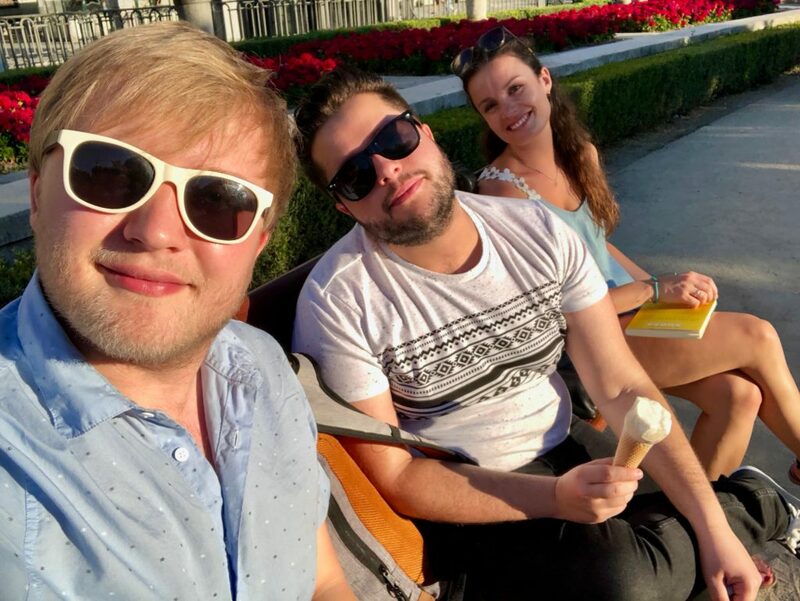 This time we’d decided only to spend half the day there, as indeed we hadn’t forgotten to schedule in a good night out – and I really wanted to get some kip in before having to face a late night on the town! This time we followed the path in reverse, opting to head upstream rather than downstream, but regardless we didn’t actually make it very far. 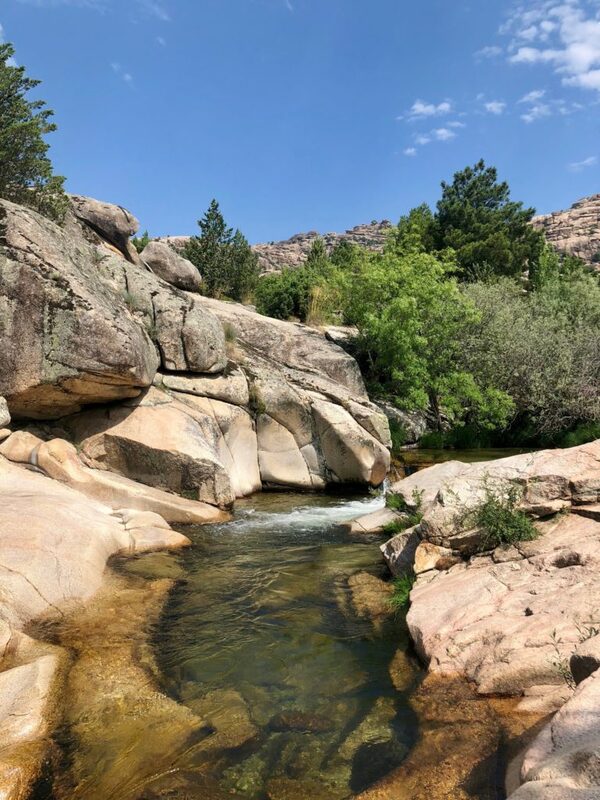 We decided instead to set up camp on a flat rock plateau on the shore of the river, where we cracked out some picnic leftovers and proceeded to relax in the sun for gosh knows how long. After dipping my toes in the (very cold) water for a while, and after a quick yoga session led by Heidi from which I bailed rather early on, we eventually decided to head further up the river a little bit more. In the end we didn’t make it much further, as once we sat down in a little outpost for a drink and a pincho, we all gave each other that glance which said that we all knew that when we next moved it’d be in order to head back in the direction of Madrid. 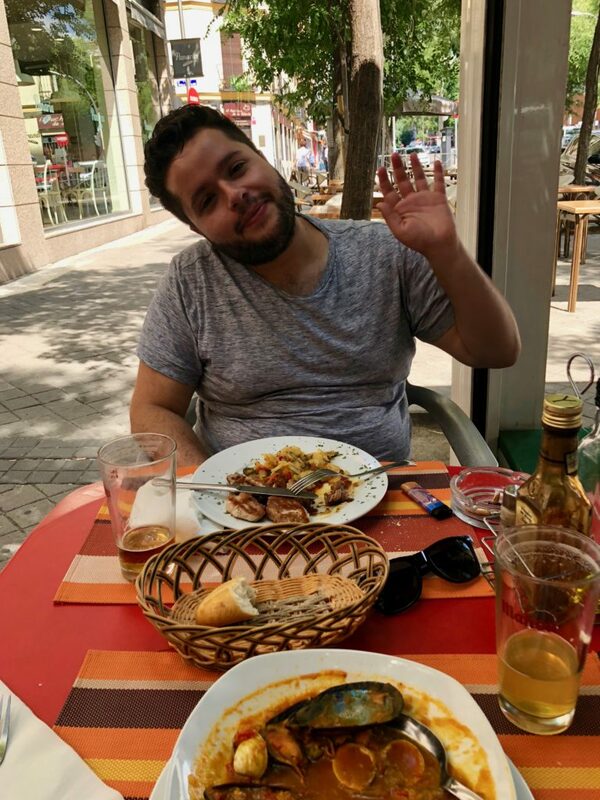 After finishing off our pincho de tortilla (Spanish omelette), we meandered our way back into the town centre and hopped on the bus back to civilisation. Just a few hours after departing ways once we arrived in Madrid, we were once again reunited on the roof terrace of Heidi and Loredana’s flat, dancing around as we had a few drinks before we headed to the club. 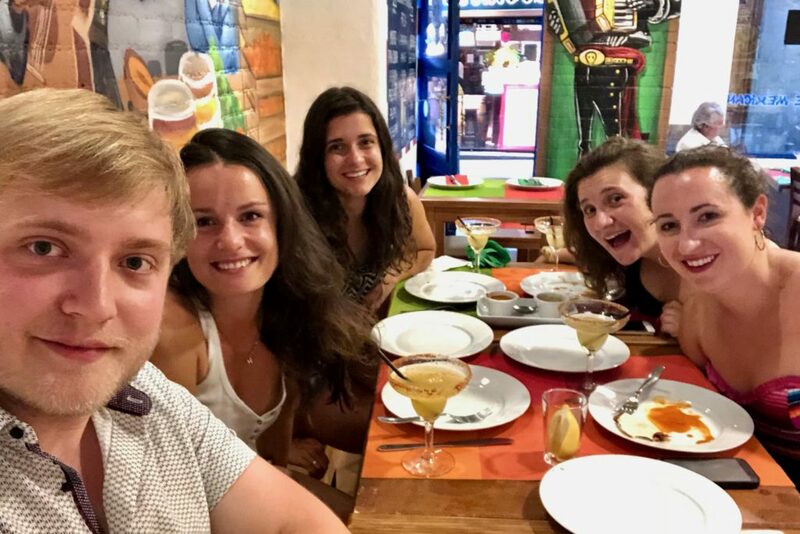 The location for the farewell night out was an old favourite, a cheesy karaoke bar, but we had a fabulous time there – probably me more than most as, thanks to the team at Erretres’ efforts, I knew pretty much all of the Spanish classics that came up. I was even invited onto the stage to sing along with a group of locals who were out on some kind of hen do – it was quite the experience! As the evening approached, I was joined by Megan and Heidi to head into the city centre for a farewell dinner for Megan, who was catching a flight the day after. We eventually found a quaint Cuban restaurant along the way and headed in, enjoying a delicious meal of tamales, spiced meats and all the trimmings; all accompanied with, of course, a mojito. Another farewell ensued, as I had to say my hasta luegos to Megan, but the loss of yet another member of Cake Club was offset slightly by a surprise from Kevin – he was coming to stay in the city for a couple of evenings! Okay, so, admittedly this had been planned a few weeks ago when Kevin called to organise a stay at mine for one night, but as any of you who know me will know, I am hopeless at remembering literally anything. 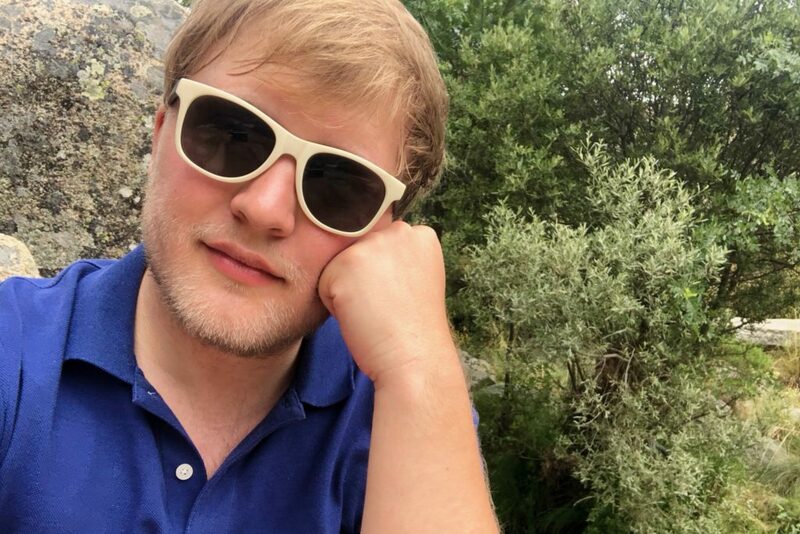 As I’d neglected to mark the date in my calendar directly after, I had totally forgotten which day I had agreed to host Kevin down here in Madrid, but thankfully neither had I planned anything else for the 36 hours he was in the city! After meeting Kevin directly from work, we headed back to mine for him to drop his stuff off, before heading out to have some lunch at an unassuming little bar just down the road from my flat. There we had a slap-up menú del día, as I feasted on lentils, seafood soup and the world’s most decadent orange and white chocolate cake – for a small bar which I’d never been to, we were both surprised at how tasty the whole thing was! Kevin arrived and the two of us immediately set about eating. 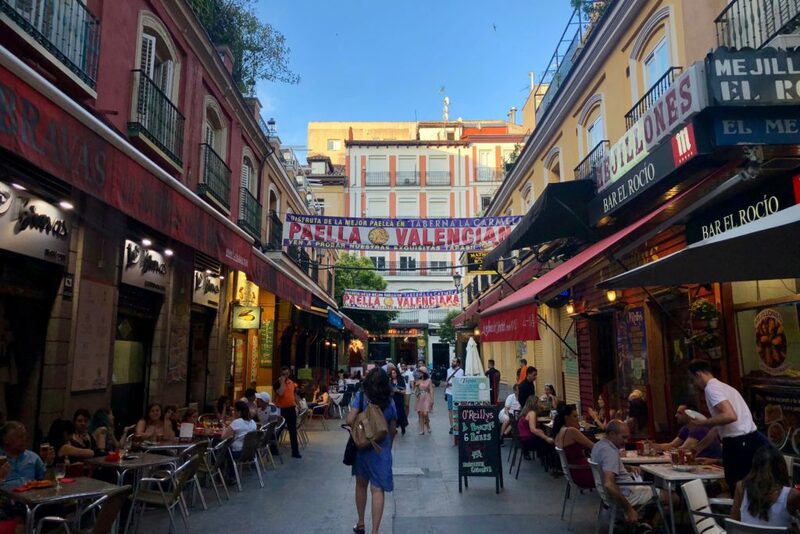 After stuffing ourselves and then making a quick dash around Mercadona for a few supplies, we headed back to mine for a quick break, and then headed back into the city to spend the evening having a few drinks in Chueca. 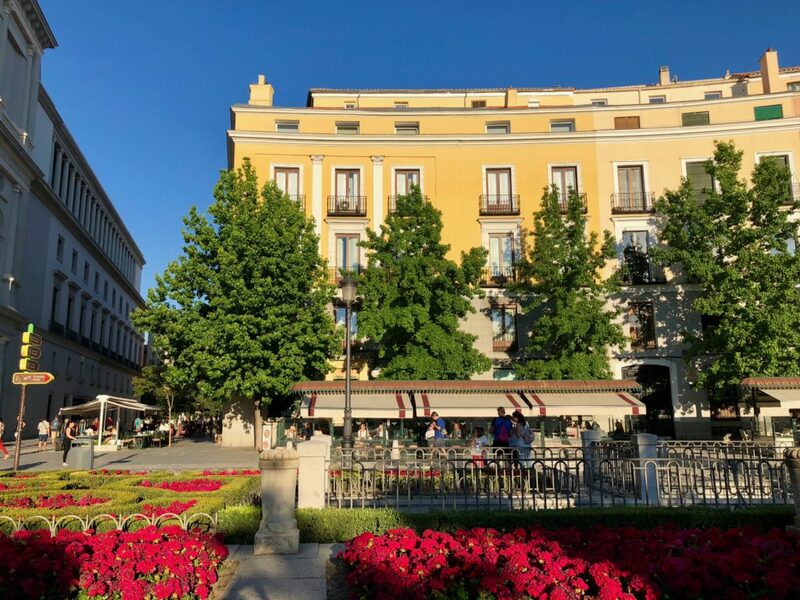 With the city in the opening days of its pride celebrations, the atmosphere in Chueca was buzzing, and after exploring the many streets of the kooky district, we settled down in the central plaza and ordered a big jarra of beer to keep us going for the night. 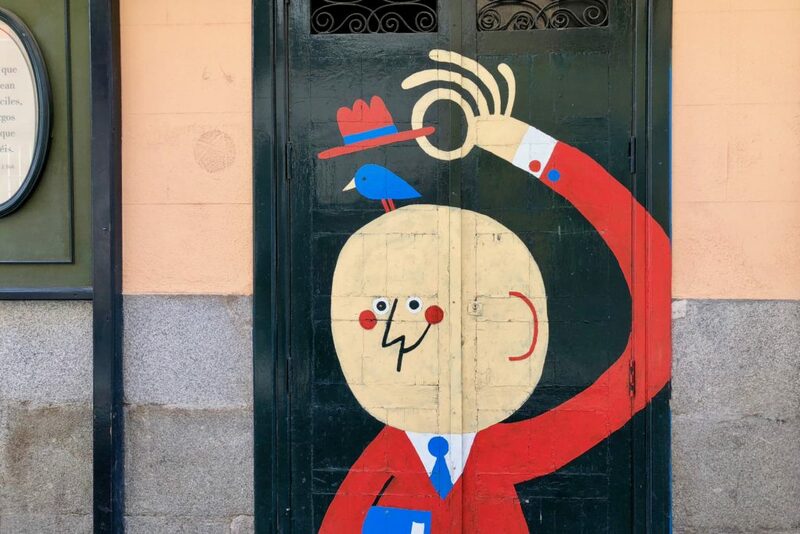 After watching the world go by and having one of our usual deep chats, we decided to make our way home on foot in order to take in some of the evening atmosphere, stopping for another drink in Lavapiés before we turned in for the night. 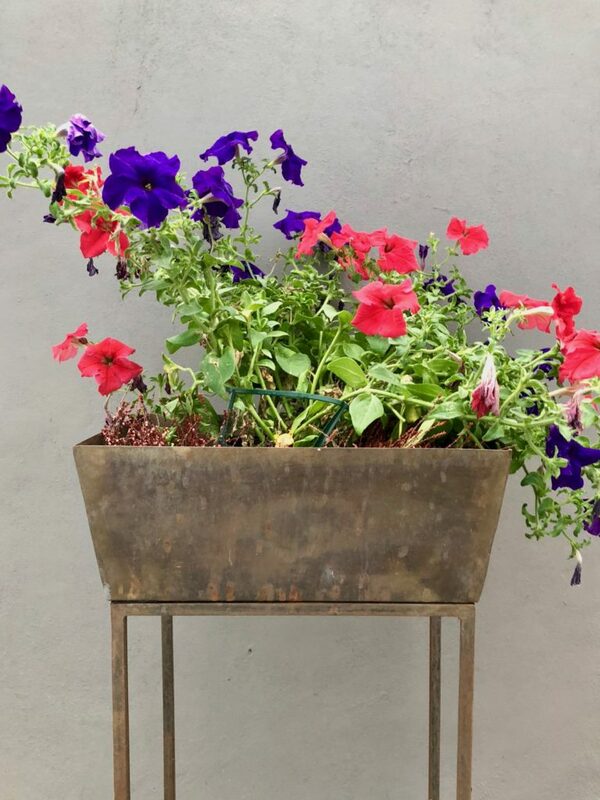 The next morning I had to inflict a 7am start on poor Kevin, as at work we are now on our summer timetable which means my working hours are reduced to 8am – 3pm. He had to head into the city himself anyway, as the whole reason he was here was to head to an induction for the exchange programme which is sending him to the USA later this year! We parted ways as I descended into the Metro, but at 7pm we were both reunited in the city and ready to make the most of another evening before Kevin had to catch his bus back northwards at 11:30pm. That evening we were also joined by Heidi, the last remaining member of Cake Club, and we headed out for tacos – but not to our usual place. 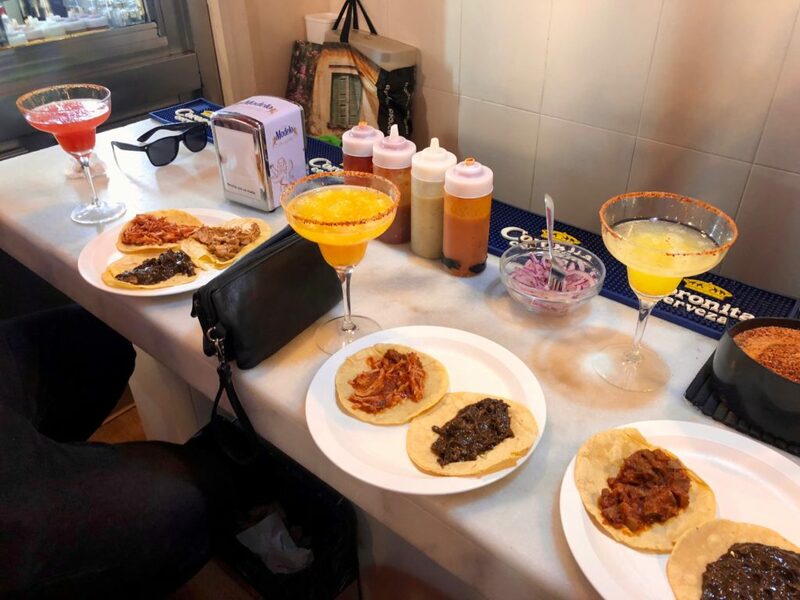 Instead we headed to the tiny taco bar which I have been obsessed with ever since I first moved out to live in Madrid, and which I’ve dragged many many visitors to. Kevin was no exception last time he was here, and he asked that we go again: a request I had absolutely no qualms in fulfilling. After we’d cleaned off a couple of rounds of these delicious tacos, we headed into the city for dessert by the royal palace, a lovely spot if any to spend half an hour or so. 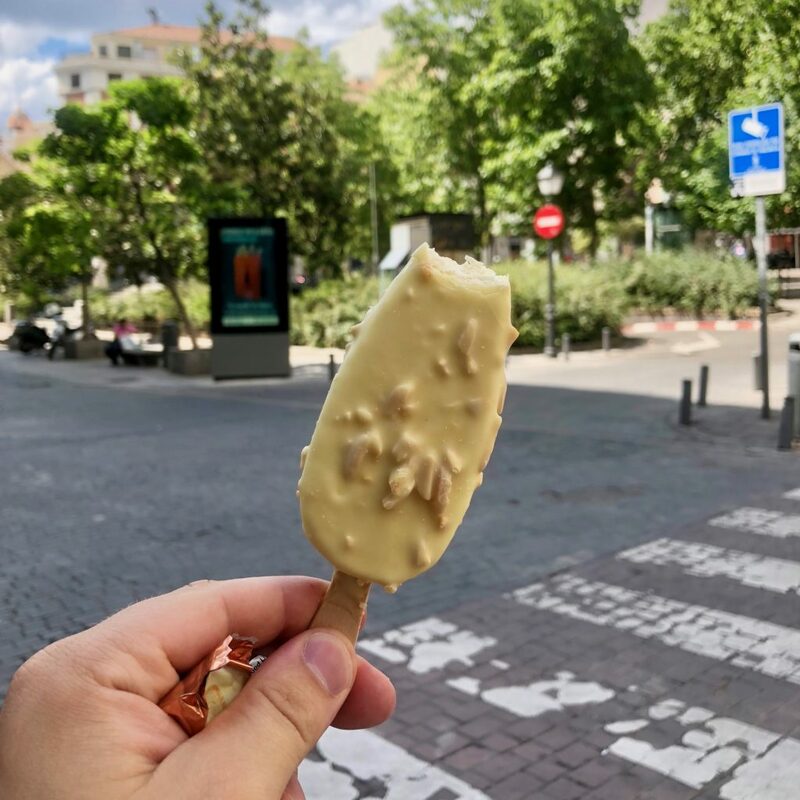 We picked up some ice cream along the way, watching the tourist bustle around the gorgeous Oriental Gardens and Royal Opera. As 8 o’clock neared though, we decided that we’d like to go and see how England would perform in their World Cup match against Colombia, and so we found a bar which was showing it (i.e. pretty much every single one) and prepared for the game. Some of you may wonder what I was doing watching football as it’s not usually my cup of tea, but in case you have forgotten I have attended two(!) matches in the past – one in Burnley and the other Atlético de Madrid. And now for the last little update, taking the form of a night out with friends in the city for pride! 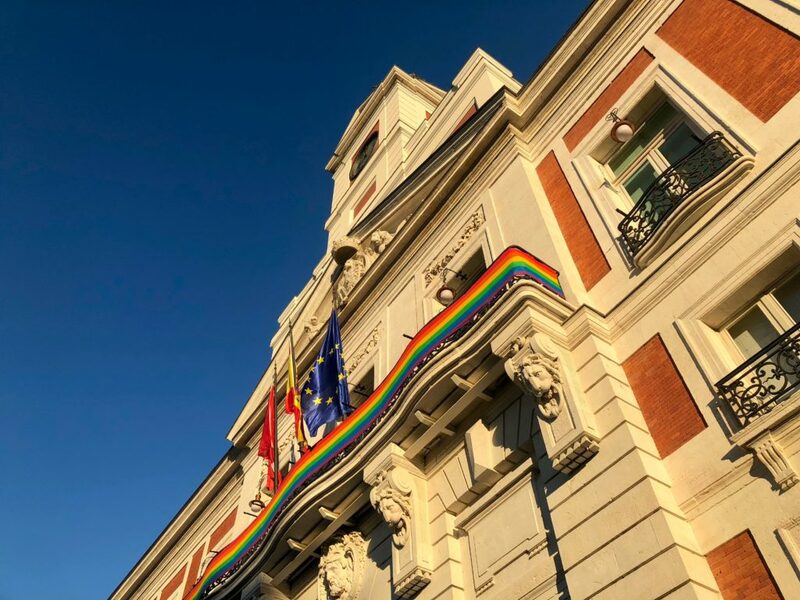 As you’ve already seen above, Madrid is once again (after I attended back in 2016) bathed in rainbows as the pride celebrations kick off, and naturally I wanted to get stuck right in. 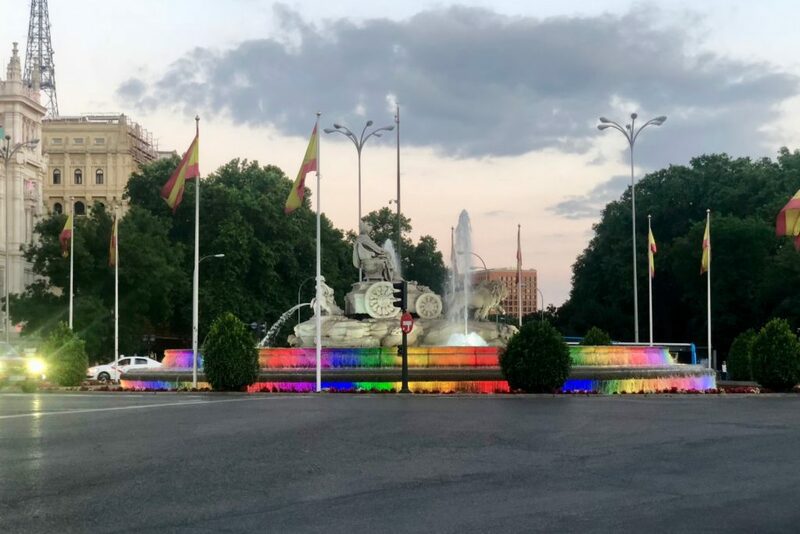 The only issue I had was the badly timed trip down to Murcia, which I’d managed to book right over the two main nights of the pride parades and celebrations – damnit! I didn’t completely miss out on the festivities, however, as I was invited along to meet a group of my friend’s friends on the Thursday evening for a night of watching the live music, chattering away and downing mojitos which came at 5€ a pop and were served in huge cups – my kind of night out! I had a wonderful time and met some crazy fun people, and three of us eventually wound up sat in a bar, tipsily talking nonsense and inhaling some huge sandwiches which we’d bought ourselves. 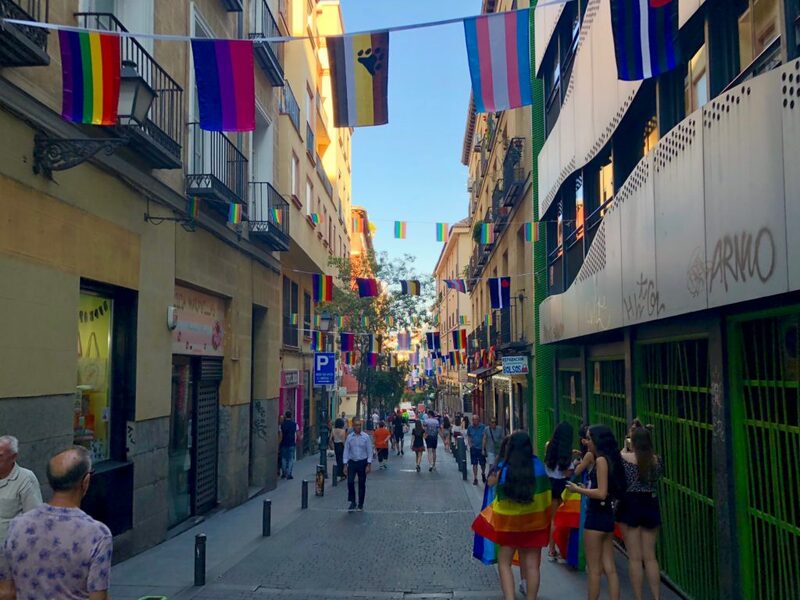 It was a lovely reminder of just how inclusive my adopted city is, and although I did miss out on the bulk of the party, I have just retuned from a fabulous weekend down with my mum and sister in Murcia. I have mentioned this trip twice now, and I promise that I’ll be back with photos from it soon, but I feel that for now I have bombarded you all with enough updates for one post!